2. Wash and trim ends from beans and cut to 4-inch lengths. 3. In each sterile pint jar, place 1 to 2 dill heads and, if desired, 1 clove of garlic. 4. Place whole beans upright in jars, leaving 1/2-inch headspace. Trim beans to ensure proper fit, if necessary. 5. Combine salt, vinegar water, and pepper flakes (if desired). Bring to a boil. Add hot solution to beans, leaving 1/2-inch headspace. 7. 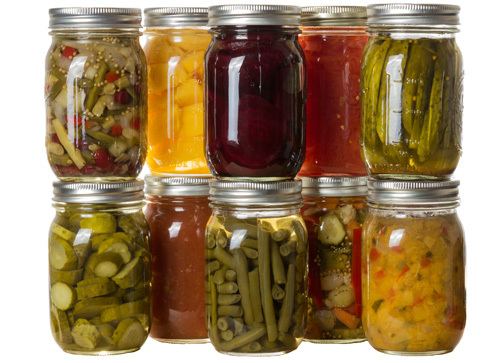 Adjust lids and process jars immediately in a boiling water canner according to the recommendations. 8. Let cool, undisturbed, 12-24 hours and check for seals.